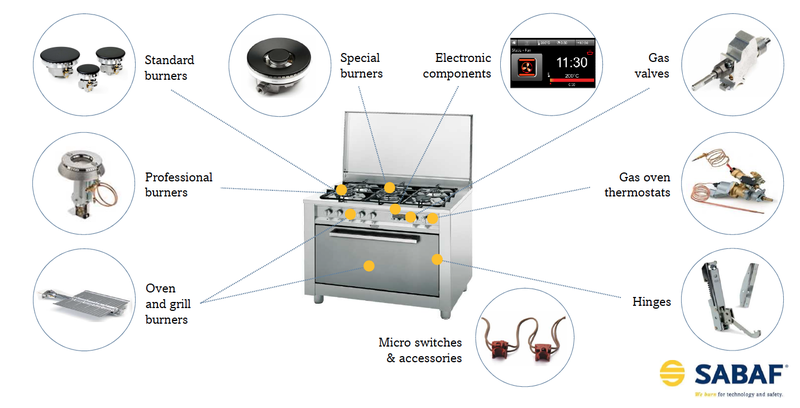 From taps to thermostats, from burners for domestic appliances to those for professional appliances, from hinges to electronic control systems: the components make the difference in the kitchen, making it not only efficient but also safe, sustainable and technologically advanced. Thanks to a series of investments in recent years, Sabaf is able to offer a complete range of components for kitchen appliances, realized by the brands that are part of the Group: Sabaf (taps, thermostats, burners), Faringosi Hinges (oven hinges), A.R.C. (professional burners), Okida (electronic control systems). As regards to the gas burners, the latest Sabaf models guarantee an efficiency of 68%, higher than the European legislation which requires, to obtain the homologation, to achieve an energy efficiency of 52%. Thanks to Okida’s electronic control systems, appliances can communicate with each other, interfacing in an intuitive and simple way. Besides, safety is guaranteed by the gas taps and thermostats, while the hinges stand out for their durability.